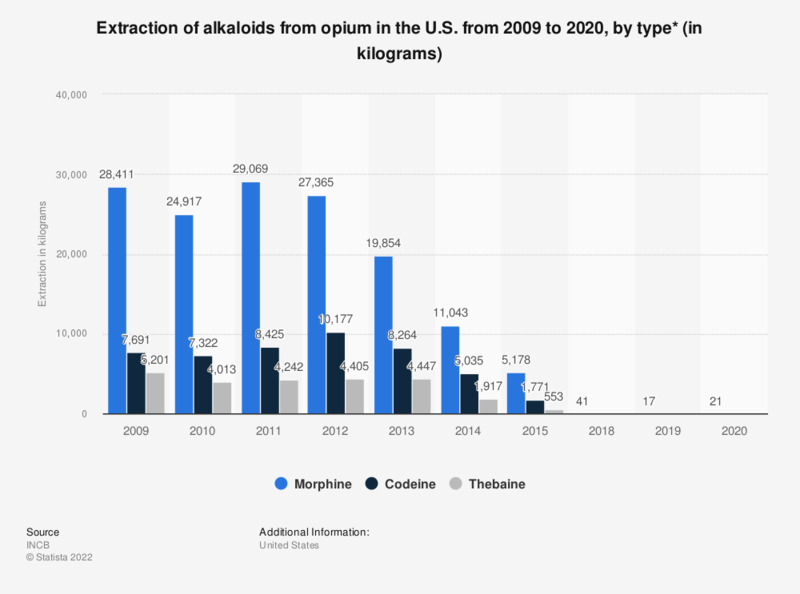 This statistic displays the total extraction of alkaloids from opium in the United States from 2009 to 2015, by type of alkaloid. In 2010, there was 24,917 kilograms of morphine extracted in the country. Global consumption of this drug has grown by almost a factor of six between 1991 and 2010. Differences around the world in consumption levels of morphine for pain treatment are due to economic, knowledge, and regulatory factors. Statistics on "Drug use in Denmark"
Did you consume any of the following illicit drugs recently? When did you consume cannabis or other illicit drugs last time? Do you use tobacco with your cannabis? What tobacco products do you smoke? Do you use snus, chewing tobacco or other smokeless tobacco products? At what age did you begin to smoke regularly? Because of which drug are you in treatment?